Cash collection is an art. This art, done by the collection manager, requires the conjunction of many skills and sensibilities to reach a full effectiveness. The reality of this activity carried out in companies working in B to B (Business to Business) by a very large number of specialized and non specialized people is far from the popular caricature of this profession falsely imaged by the abusive practices (harassment, ...) of some collection agencies acting towards individuals. What are the keys of cash collection? The plurality of skills required and the ability to implement them together, although they may seem contradictory, are critical to the performance of each collector. These difficulties (it's an art!) explain the differences in performance that can be abysmal between two collectors. For managers and other CFOs, the risk is to underestimate this function in their organization and to consider it as a non-value-added activity (just call customers, ...), whose cost must be reduced to a bare minimum, when in reality it represents opportunities for considerable improvement of quote to cash process. The time factor is an essential and decisive element in the success of this mission. Indeed, there is a direct link between the time spent and the probability of recovery of a bill, whether for customer solvency issue or because administrative reasons (loss of information, change of contacts, difficulties in mobilizing people on old files, ...). After 6 months of delay, only 50% of the receivables are recovered while the time and energy needed to try to obtain the payment is increased exponentially. The more time passes, not only the time and energy needed increase but the recovery rate also drops drastically. 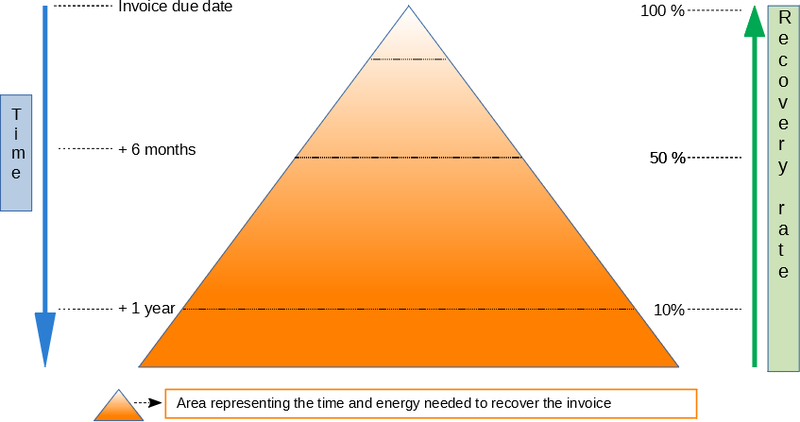 The objective is to remain systematically (for each invoice) in the upper part of the triangle in order to minimize the time spent and maximize the probability of recovery. For this, it is necessary to apply a collection scenario that includes a progressivity in the actions performed. The amicable recovery process has a beginning and an end within a defined period. The progressiveness of the actions up to the formal notice is easily applied as the previous actions have been executed, the problems identified and fixed. This progressivity makes possible not to stagnate at level 1 of recovery process and spend much more time on the case. Special cases (disputes, miscellaneous problems delaying payment) are taken into account and are managed with a suitable scenario (specific actions) but with increased attention for rapid processing. Whatever you do, you educate your customers. If you are permissive and allow time to take action, you educate your customers to pay late. If you are serious in your management and chase up your customers precisely when you have to do it, you educate them to pay you on the due dates of your invoices.. Contrary to popular belief, a rigorous follow-up makes it possible to perpetuate the commercial relation, whereas the opposite in fine harms it. Read: The time factor, key of debt collection. Sending blind robotic reminders to a generic address (for example, mass mailing) has never been effective, and is less and less efficient. The search for the right contact(s) as well as the understanding of the internal customer-side invoice management process is essential. Thus, the recovery action is oriented successively depending on the identified problem (a late payment = a problem) to the right person or department, who can unlock the situation, and move on to the next step. Indeed, the payment of invoices is more and more standardized with processes allowing a more efficient management, especially in large companies and administrations. The seller must adapt to these operating rules and act accordingly. To be effective, the action, must be done at the right time, to the right person, with the right information. All the information concerning the customer's organization and the history of the actions carried out as well as the comments received must be easily accessible in one place. This in order not to lose information and restart from the beginning each time but to capitalize on the experience. Each action is thus adapted according to what happened during the previous exchanges. How to agree with your customer on the invoices to be paid if the customer account is not perfectly clear in your accounting system, updated day by day? Any discrepancy between customer accounting (AR) and supplier accounting (AP) leads to late payments, time lost on both sides to reconcile and loss of credibility towards the customer. Here also the "Triangle Express" (diagram above) applies as it is difficult to find the right allocations on old items and / or having already undergone several writings. Debt collection is a matter of communication between two organizations (those of the seller and the buyer) that are not natively made to talk to each other. The natural divergent elements (information systems, corporate culture, management rules, ... are different) are sufficiently numerous not to add a layer of accounting mismanagement. The account manager is a partner of his alter ego on client side. He contributes by the quality of his follow-up to the good performance of the accounts payable, and thus facilitates the payment of invoices. The accounts receivable must be kept daily as soon as the payments are received. Any discrepancy must be fixed immediately in order not to allow a drift, rendering the accounts illegible and ultimately irreconcilable. A coherent and facilitating organization must be put in place between the various interlocutors (accountant, collector, customer, ...). The quality of the relationship established with customers contacts is essential. The objective is to build a balanced relationship over the long term, just like the business relationship, both cordial and demanding (an iron fist in a velvet glove). Sensitivity, in order to perceive blocking problems and to create a positive relationship, is therefore combined with the rigor required to the client to respect his commitments to pay his bills on their contractual due date. This relational ease while remaining demanding is coupled with the ability to address different contacts on the client side (accountant, purchasing manager, chief financial officer, general manager, ... depending on cases) and internally with its own colleagues (sales, accounting, customer care, ...). involve these interlocutors in this strategic and cross-cutting stake to get their help if necessary. Indeed, the intervention of the sales person in the collection scenario can be very effective. Sales has other inputs with the customer and can thus unlock situations. The collector thus makes the bridge between two different and sometimes opposite worlds: finance / accounting and sales. develop the "cash culture" within the company. 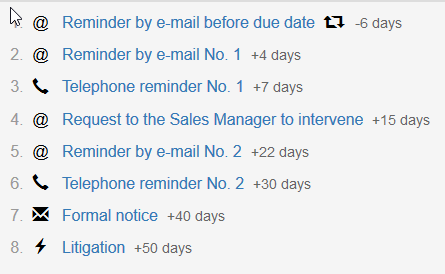 Each function that is in contact with the customers must be aware that the ultimate goal for the company is to be paid on the due dates of the invoices. Quality of relationship is the drop of oil allowing a gear to get started and operate, despite some technical hiccups often unavoidable. All communications and exhanges with customers and internally must be done to make people act in order to resolve issues that prevent the payment. If you want to use a credit management and collection software, which is strongly recommended, choose a modern solution to easily personalize e-mails, letters, SMS, etc., rather than the first-generation of robotic tools. It is not so simple to combine these four pillars, sometimes complex, often contradictory. This is a real art, done by the collector who, depending on the customer and the commercial situation, makes a careful mix so that the financial interactions between the two actors are fluent. Those who do this help to solve problems and obtain payment of bills, improving the cash flow and profitability of their business, while contributing to the quality of the customer relationship. They are also productive in identifying the receivable on which attention must be focused, and in automating actions on others. What is the result of 5 4 ?